When I was leading IT projects, a large part of the role centred around change management. A new piece of software, hardware or procedure would be implemented because it would have long-term benefits. However, there was also short-term inconvenience as people learned new systems and adapted to a different way of doing things. In organisations, transition is viewed as something to be carefully managed and understood. I wondered what lessons I could bring from my professional experience into my own life as change looms large this year. There is a general view that people don’t like change. I challenge that. If someone was to hand me a million dollars (seriously, feel free) it would change my life. I wouldn’t be upset about it (seriously, try me). The issue is that change often pushes us into the uncomfortable. It’s the uncomfortable that concerns us – not change itself. I definitely do not want to live my life within the confines of my comfort zone. To grow, to succeed and to achieve my dreams I need live with discomfort. Back to Change Management 101 and how it might apply in actual, real life to help overcome my fear of change. Communication. For change to be effective in an organisation, constant communication is imperative. I won’t be sending myself or my family regular email updates, but I will be clear about what I will be doing, how I will be doing it and why I am doing it. The changes this year will affect everyone in my family and we need to make sure we talk about how we are feeling, why we are doing what we are doing and whether we need to take a moment and re-assess. For instance, I will need more quiet time to myself to achieve this year’s goals – I need to communicate the times I am taking that time and place boundaries around that time. WIFM – what’s in it for me? When change is occurring across a company, you won’t escape someone banging on about WIFM – letting everyone know how the changes are going to make their lives better. Some change we choose and some change is thrust upon us. Either way, it makes sense to take a moment and understand the positives that will come about because of that change. If it’s difficult to find a positive, try to create one. For instance, if you are feeling quite sad about your youngest starting school this year, organise a few things just for you whilst your children are at school so that you can look forward to that. Minimise fear, maximise excitement I fear the unknown – I am a perfectionist and a control freak – so I am not comfortable flying by the seat of my pants. Change necessarily means entering into the unknown and letting go of control. The trick is to see the excitement in that. Without change, we cannot achieve things, we cannot grow and we cannot challenge ourselves. It’s about harnessing that rather than worrying or gripping onto the past. A broader plan Whilst it is impossible to predict the future, it helps me to have a broader plan or goal and understand how change fits within it that picture. 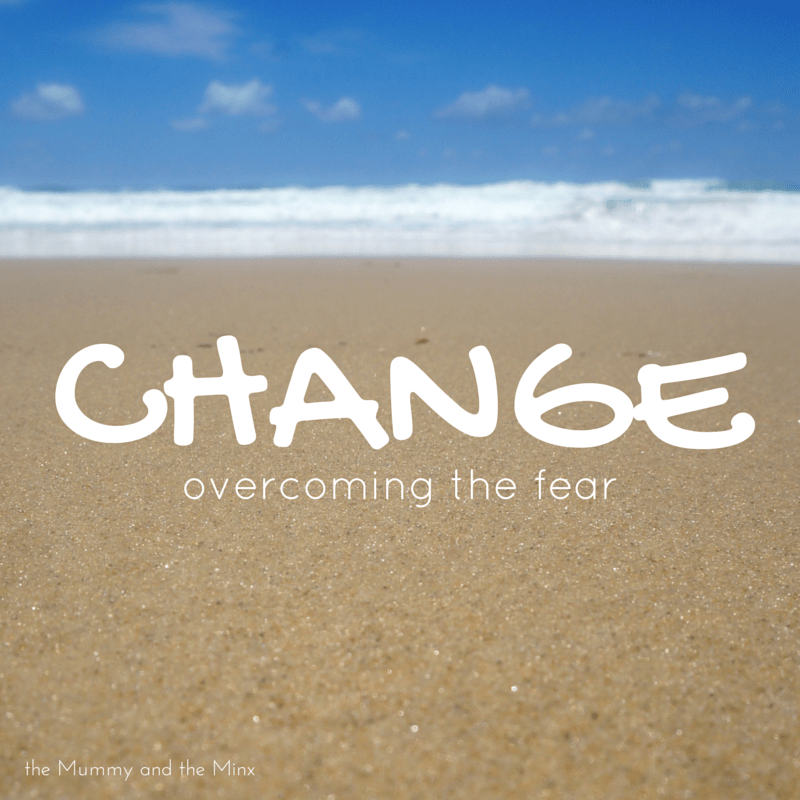 When fear grips me in the midst of change, it is helpful to project myself into the future and figure out what this change will mean in a year, two years or three years time. Sometimes, the change itself will have faded into insignificance, and other times it helps me realise what reward might be at the end of the hard yards. Clear, small steps to get there The best way to eat an elephant is one bite at a time. Sometimes change, particularly BIG change, can feel overwhelming. Making small plans helps me feel in control again. For instance, with baby E starting daycare, we made plans to have him there short hours to begin with, to ease him in. The task of setting up a new business seems enormous and unachievable, but once broken into a task list, it becomes possible. How do you handle change? Do you love it or loathe it? What changes do you have coming up this year? Daycare IS a big adventure – lucky they have bantam hens there which seems to do the distraction trick long enough for me to escape! Baby E has decided what’s in it for him is cute fluffy chickens. And yesterday, I got actual, real, grown-up work done. Yay! I am so glad you received it a-okay. I hope I don’t come over all Pollyanna but I do believe in trying to put a positive spin on things. I look at big things and freak out, but I can do a list of tasks. That I can do. Thanks for popping by! I have struggled putting my kids in daycare for a number of reasons, I should have taken note of this plan ages ago. It’s such a guilt-inducing thing isn’t it? Even when you know you will be a better parent, partner and person for it.